VNOG Blog: Some thoughts on "Ratatouille"
I couldn't be more excited about an animated movie than Ratatouille. It will probably be the highlight of the year for me.. Here here! From what I've seen in the trailers, the acting doesn't seem to read as acting for an animated movie, these characters just seem to exist. I'm so excited for Ratatouille! I've been promoting it like crazy actually, well as best I can... basically every one of the 12 movies currently playing at my location have Ratatouille trailers on them... I wonder how that happened??? Way back when Happily N'Ever After was out, I witnessed a father and son leaving the theater kinda disappointed. The little boy kept pulling his dad's arm and pointing at the Ratatouille poster in the hall saying "I wanna see dat one" and the dad said "don't worry we'll definitely go see it when it comes out." Little things like that just make my day and is why I love my job. I love observing how the audience reacts to movies, it's just so awesome! Maybe this information will come in handy someday when I become an animator myself, if nothing else I see a lot of interesting characters with interesting quirks that will be fun to animate someday! I have a feeling this movie is going to do really well, just from what I've seen so far. A lot of people trust Pixar!!! I'm definitely going to see Ratatouille in theaters! I'm really excited to watch it! All the trailers and podcasts have gotten me really looking forward to it!! and Remy is so adorable! From what I've seen, you guys at Pixar have put in so much detail into the movie, it's truly amazing. Amongst one of the many things I noticed, I loved how Remy's fur is so realistic and how you can see his chest moving from his heart when it's pounding! I'm glad that you think it's fantastic! It makes me even more excited to watch it! thanks for the post! Can't wait for it Victor. I think I may be seeing a Sneak Peak this Saturday! Congrats! Victor, hit it on the money! I just saw the movie! and WOW, I saw it through the myspace event, and I am going to see it again and again. I couldn't believe the acting, and animation...so much Charlie Chaplin inspired type work and the writing is just... just, great!! The detail in everything is ungodly I loved the textures and lighting. I can not, I just can't express how gorgeous this film is! Everyone must see this movie! 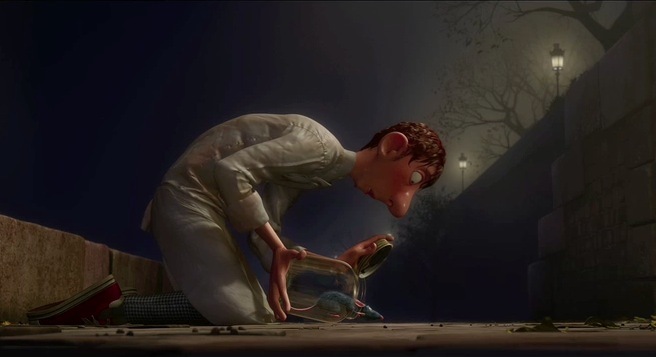 Of the reviews I've heard concerning the film (yours included, Mr. Navone), it sounds as if Ratatouille is Pixar's best and funniest production yet. This thing is gonna be delicious...literally. Thanks for the review! I look forward to seeing the film on June 29!! This is music to my ears Victor! my husband and i have been looking forward to seeing ratatouille ever since we first heard about it. so glad to hear such good buzz on it! we'll be there opening weekend and we'll probably blog about it and urge all our friends and family to go, too. I'm looking forward to Ratatouille just as much as the next animation student, so of course I'll go see it in theaters. But, besides that, I hope that someday I get the chance to be a part of a project that brings out so much in all the people who worked on the film. You said you only worked on one shot, but you seem invested in the movie, and the characters. I can only image what it would be like animating full time, and really develop a love for those characters. I love watching the behind the scenes extras and seeing how much effort and care is put into the Pixar films. It has to be an amazing experience to be a part that. Thanks for the great post victor! I was waiting for this. I really can't wait to see Ratatouille in the theaters. This is going to be great! WOOHOOOOO!! I've been waiting for this... Definitely would be worth the wait, just need to hold on a few more days before it shows here. The acting is superb based on what I have seen in the trailer and 9 mins preview. The way you guys made the food.... mouthwatering. You were so right, and then some. Definitely wasn't just the alcohol talking. I'll be sure to push as many people to the theater as I can. I seen the sneak screening with my brother and sister, and a friend of mine. All of whom loved it. It really is a special film. One that as it was rolling, I knew would be seen by kids and people of all ages for years and years to come. That's something to take pride in. That it's not just this month's box office take, but a piece of art that will be enjoyed long after that money's wasted. "It wasn't the German gin." 'Scuze me, that alcohol line immediately reminded me of The Third Man. I'm definitely looking forward to this movie. I've been cautious about it for some time, perhaps a fear that Pixar was losing its creative spark after Cars, and the Disney merger and all that. But then I remind myself of the hideous state of American animation without Pixar, and realize my folly in being so doggone picky. I know the knives are out in Hollywood for Ratatouille to, ahem, "fail." So I'm doubly hopeful that this becomes a successful hit. Lasseter and company are making some bold moves at Disney, and a solid Pixar success can only cement that momentum. Goodbye, crappy video sequels! Hello, Brad Bird! With Ratatouille, Paprika, and Persepolis, this is shaping up to be an excellent year for quality animation. Let's be sure to do our part, people! I saw it and adored it! From the acting to the dialogue to the music, the film was très magnifique! I'm telling everyone I know to go and see it - I know it will make them as happy as it made me!